What do photographers get up to on holiday? They snap hundreds more photos of course – just ask my better half after the three of us (me + wife + camera) spent a couple of (mostly) happy weeks in Norway. Gone are the days of abusing friends’ patience with endless slideshows of “us at the newly discovered 8th natural wonder of the world” – that’s what Social Media is for – but it occurred to me that some of the images captured on that trip might form the backdrop to a brief tutorial. 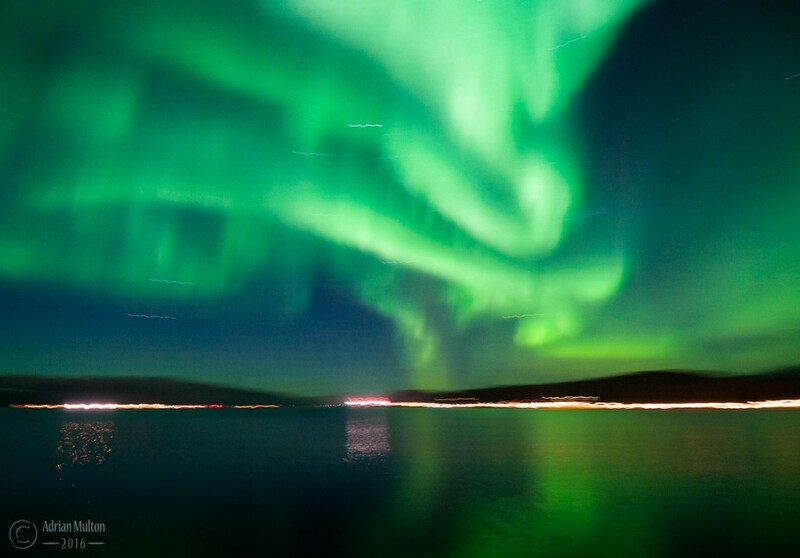 One of the highlights of our holiday was witnessing not one, but two amazing Northern Light shows – something every tog wants to bag, given the opportunity – but which kit and camera settings are going to do the job? Apart from your camera, the most important bit of kit is a tripod. You will be wanting to expose for longer than you can hold the camera steady. A small torch may also be handy. To see the night sky clearly you want to find a location unpoluted by street lighting, so a torch will help you find camera controls and prevent you tripping over your tripod. 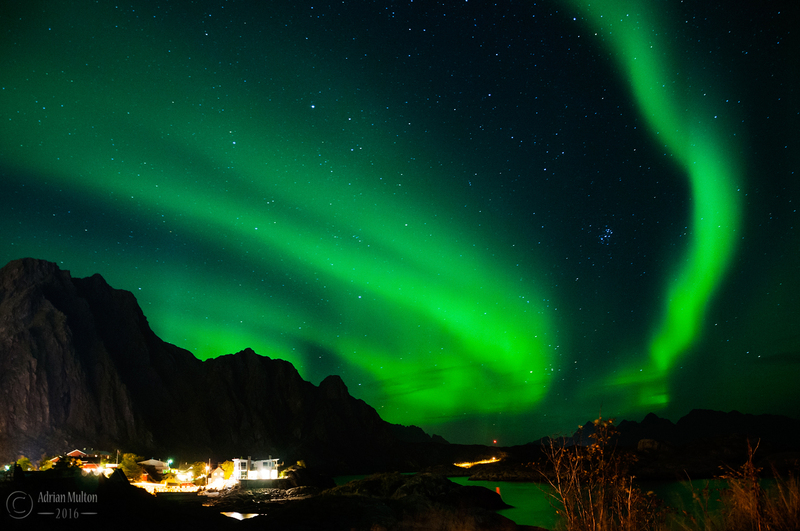 That’s not a joke by the way; I didn’t have a torch in Norway and consequently trod on and snapped one of the legs of my flimsy telescopic travel tripod. All was not lost, however; since I was pointing my camera upwards, I merely placed the shorter leg to the rear to help provide the elevation required. When working with long shutter speeds a useful feature on some cameras is the self-timer delay. Set this to 2 or 5 seconds so as not to jog the camera when taking the shot. Probably the trickiest thing to control is focus. Your autofocus will struggle to find anything to lock on to. Mine did manage to focus on the mountain a couple of times, but you can waste a lot of precious time listening to it struggle. Another option is to switch to manual focus and focus on infinity – as mentioned earlier, the lights themselves are not sharply defined objects (they are constantly moving, albeit not always noticably), so ‘infinity’ should be fine for both Lights and any landscape visible on the horizon. 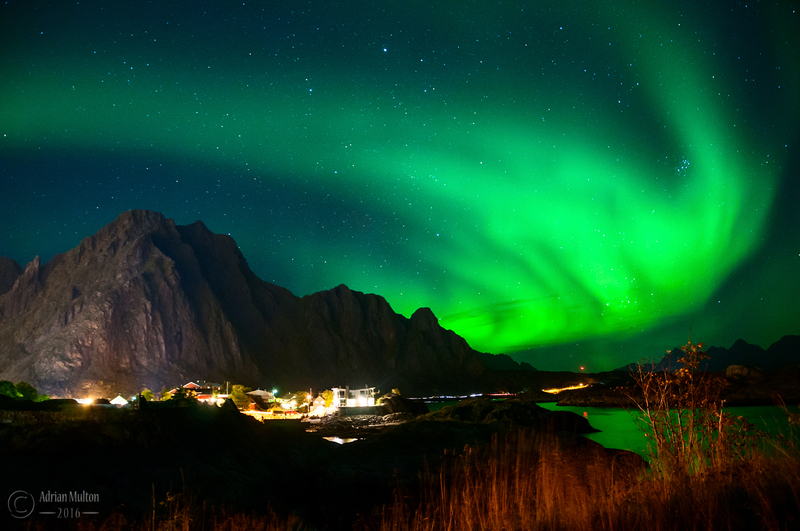 My first evening shooting the Northern Lights was on terra firma (just outside Svolvaer); a few nights later came a mini cruise through the fjord that bisects the city of Tromso. The boat allowed us to escape urban light polution and the skipper turned off the on-board lights of course. The challenge was that the boat provided a moving platform. Ideally I would have pushed up the ISO and reduced the shutter speed to deal with the gentle motion of the boat, but knowing my D300 would throw a good deal of ugly noise my way if I did that, I limited myself to ISO 500 and cut the shutter speed to 15 seconds. The maximum aperture was f4 on a 12-24mm wide angle lens. As you can see, the movement blurred the city lights at the base of the images, and the Northern Lights, which were much more mobile that night, are blurrier too – but I still liked the overall effect, and definately prefered it to noise. Whatever else you do, turn off the built-in flash; unless you are photographing someone with the Northern Lights in the background, flash will do absolutely nothing for you. One last thing – bag your shots, but don’t spend the whole evening with your face glued to a camera. 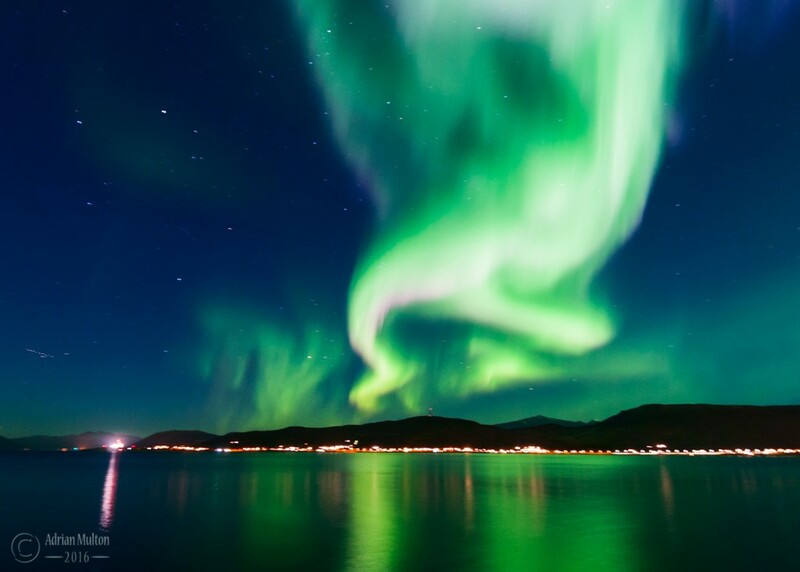 The Northern Lights are not static, they perform a celestial ballet – graceful with sudden bursts of spectacular action – so be sure to enjoy the show, maybe with an arm around your loved one. To chat about photography or Photoshop tuition for absolute beginners, call me on 07757 259390 or send me a message via email.